(2) you can not modify the website or its data in any way or reproduce or publicly display or distribute or otherwise use the Website and its data for any public or commercial purpose unless otherwise permitted With the present. B&M Theocharakis Foundation for the Fine Arts & Music reserves the right to alter or amend the applicable terms and conditions for the use of the site at any time. Such changes, modifications, additions or deletions to the terms and conditions of use will come into force immediately upon their disclosure, which may be given by any means including, but not limited to, the placement of new terms and conditions on the site. Any use of the Site following such alteration or modification will be deemed to constitute acceptance by You of such changes, modifications, additions or deletions. 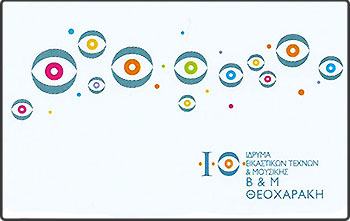 B&M Theocharakis Foundation for the Fine Arts & Music may, at any time, terminate, change, suspend or discontinue any particular function of this site. In any circumstances, B&M Theocharakis Foundation for the Fine Arts & Music, its employees or other representatives shall have no liability whatsoever for any consequential, incidental, indirect, special, indemnities or costs or financial penalties, including, but not limited to, lost profits, business discontinuance , Loss of information or data, or loss of customers, loss or damage to property, and any third party claims arising out of or in connection with the use, copying, or disclosure of this site or its contents; Or any other linked site. All web site design, text, graphics, selection and configuration are copyrighted and protected under Intellectual Property Rights. Each trademark appearing on this site is registered and protected under the applicable trademark law and is used herein with the permission of their respective owners.